Apigenin (4′,5,7-trihydroxyflavone), found in many plants, is a natural product belonging to the flavone class that is the aglycone of several naturally occurring glycosides. It is a yellow crystalline solid that has been used to dye wool. In in vitro experiments and animal studies, a variety of potential biological activities of apigenin have been identified. Apigenin induces autophagy (a kind of cellular waste-recycling system) in leukemia cells, which may support a possible chemopreventive role. Induced autophagy interferes with the action of the chemotherapy drug vincristine. Apigenin is a potent inhibitor of CYP2C9, an enzyme responsible for the metabolism of many pharmaceutical drugs in the body. Apigenin dimers can reverse the highest level of drug resistance found in cancer stem cells. Apigenin has been shown to prevent renal damage caused by ciclosporin in rats, associated with reduced expression of the cell death mediator bcl-2 in histopathological sections. Ciclosporin enhances the expression of transforming growth factor-β in the rat kidney, which signifies accelerated apoptosis. Therefore, transforming growth factor-β and apoptotic index may be used to assess apigenin and its effect on ciclosporin-induced renal damage. Apigenin readily crosses the blood-brain barrier and has not demonstrated toxicity at high doses. It could thus prevent amyloid beta deposition and tau phosphorylation due to neuroinflammation, which are associated with Alzheimer's disease. Through effects on cell signaling, inflammation, cell cycle, and protease production, apigenin has demonstrated effectiveness against a wide range of cancer types, while not showing toxicity to normal cells. Apigenin is able to block the phosphorylation of certain proteins in pathways that, in the case of a cancer, are over expressed like NF-κB, PI3K, etc... These pathways can induce proliferation, migration and invasion if not regulated. Apigenin is found in many fruits and vegetables, but parsley, celery, celeriac, and chamomile tea are the most common sources. Apigenin is particularly abundant in the flowers of chamomile plants, constituting 68% of total flavonoids. Apigenin is biosynthetically derived from the general phenylpropanoid pathway and the flavone synthesis pathway. The phenylpropanoid pathway starts from the aromatic amino acids L-phenylalanine or L-tyrosine, both products of the Shikimate pathway. When starting from L-phenylalanine, first the amino acid is non-oxidatively deaminated by phenylalanine ammonia lyase (PAL) to make cinnamate, followed by oxidation at the para position by cinnamate 4-hydroxylase (C4H) to produce p-coumarate. As L-tyrosine is already oxidized at the para position, it skips this oxidation and is simply deaminated by tyrosine ammonia lyase (TAL) to arrive at p-coumarate. To complete the general phenylpropanoid pathway, 4-coumarate CoA ligase (4CL) substitutes coenzyme A (CoA) at the carboxy group of p-coumarate. Entering the flavone synthesis pathway, the type III polyketide synthase enzyme chalcone synthase (CHS) uses consecutive condensations of three equivalents of malonyl CoA followed by aromatization to convert p-coumaroyl-CoA to chalcone. Chalcone isomerase (CHI) then isomerizes the product to close the pyrone ring to make naringenin. Finally, a flavanone synthase (FNS) enzyme oxidizes naringenin to apigenin. Two types of FNS have previously been described; FNS I, a soluble enzyme that uses 2-oxogluturate, Fe2+, and ascorbate as cofactors and FNS II, a membrane bound, NADPH dependent cytochrome p450 monooxygenase. ^ Ruela-de-Sousa RR, Fuhler GM, Blom N, Ferreira CV, Aoyama H, Peppelenbosch MP (2010). "Cytotoxicity of apigenin on leukemia cell lines: implications for prevention and therapy". Cell Death & Disease. 1 (e19): e19. doi:10.1038/cddis.2009.18. PMC 3032507. PMID 21364620. ^ Si D, Wang Y, Zhou YH, Guo Y, Wang J, Zhou H, Li ZS, Fawcett JP (March 2009). "Mechanism of CYP2C9 inhibition by flavones and flavonols" (PDF). Drug Metabolism and Disposition. 37 (3): 629–34. doi:10.1124/dmd.108.023416. PMID 19074529. ^ Chakravarthi S, Wen CF, Nagaraja HS (2009). "Apoptosis and expression of bcl-2 in cyclosporin induced renal damage and its reversal by beneficial effects of 4,5,7 - Trihydroxyflavone" (PDF). Journal of Analytical Bio Science. 32 (4): 320–327. ^ Chong FW, Chakravarthi S, Nagaraja HS, Thanikachalam PM, Lee N (June 2009). "Expression of transforming growth factor-beta and determination of apoptotic index in histopathological sections for assessment of the effects of Apigenin (4', 5', 7'- Trihydroxyflavone) on Cyclosporine A induced renal damage". The Malaysian Journal of Pathology. 31 (1): 35–43. PMID 19694312. ^ Zhao G, Qin GW, Wang J, Chu WJ, Guo LH (January 2010). "Functional activation of monoamine transporters by luteolin and apigenin isolated from the fruit of Perilla frutescens (L.) Britt". Neurochemistry International. 56 (1): 168–76. doi:10.1016/j.neuint.2009.09.015. PMID 19815045. ^ Viola H, Wasowski C, Levi de Stein M, Wolfman C, Silveira R, Dajas F, Medina JH, Paladini AC (June 1995). "Apigenin, a component of Matricaria recutita flowers, is a central benzodiazepine receptors-ligand with anxiolytic effects". Planta Medica. 61 (3): 213–6. doi:10.1055/s-2006-958058. PMID 7617761. ^ Campbell EL, Chebib M, Johnston GA (October 2004). "The dietary flavonoids apigenin and (-)-epigallocatechin gallate enhance the positive modulation by diazepam of the activation by GABA of recombinant GABA(A) receptors". Biochemical Pharmacology. 68 (8): 1631–8. doi:10.1016/j.bcp.2004.07.022. PMID 15451406. ^ a b Losi G, Puia G, Garzon G, de Vuono MC, Baraldi M (October 2004). "Apigenin modulates GABAergic and glutamatergic transmission in cultured cortical neurons". European Journal of Pharmacology. 502 (1–2): 41–6. doi:10.1016/j.ejphar.2004.08.043. PMID 15464088. ^ Jacobson KA, Moro S, Manthey JA, West PL, Ji XD (2002-01-01). Interactions of flavones and other phytochemicals with adenosine receptors. Advances in Experimental Medicine and Biology. 505. pp. 163–71. doi:10.1007/978-1-4757-5235-9_15. ISBN 978-1-4419-3383-6. PMC 3429336. PMID 12083460. ^ Katavic PL, Lamb K, Navarro H, Prisinzano TE (August 2007). "Flavonoids as opioid receptor ligands: identification and preliminary structure-activity relationships". Journal of Natural Products. 70 (8): 1278–82. doi:10.1021/np070194x. PMC 2265593. PMID 17685652. ^ Thors L, Belghiti M, Fowler CJ (September 2008). "Inhibition of fatty acid amide hydrolase by kaempferol and related naturally occurring flavonoids". British Journal of Pharmacology. 155 (2): 244–252. doi:10.1038/bjp.2008.237. PMC 2538700. PMID 18552875. ^ Zbidah M, Lupescu A, Jilani K, Fajol A, Michael D, Qadri SM, Lang F (January 2012). "Apigenin-induced suicidal erythrocyte death". Journal of Agricultural and Food Chemistry. 60 (1): 533–8. doi:10.1021/jf204107f. PMID 22132906. ^ Taupin P (April 2009). "Apigenin and related compounds stimulate adult neurogenesis. Mars, Inc., the Salk Institute for Biological Studies: WO2008147483". Expert Opinion on Therapeutic Patents. 19 (4): 523–7. doi:10.1517/13543770902721279. PMID 19441930. ^ a b c Venigalla M, Gyengesi E, Münch G (August 2015). "Curcumin and Apigenin - novel and promising therapeutics against chronic neuroinflammation in Alzheimer's disease". Neural Regeneration Research. 10 (8): 1181–5. doi:10.4103/1673-5374.162686. PMC 4590215. PMID 26487830. ^ Shukla S, Gupta S (June 2010). 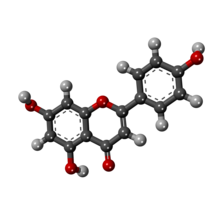 "Apigenin: a promising molecule for cancer prevention". Pharmaceutical Research. 27 (6): 962–78. doi:10.1007/s11095-010-0089-7. PMC 2874462. PMID 20306120. ^ Srivastava JK, Gupta S (November 2007). "Antiproliferative and apoptotic effects of chamomile extract in various human cancer cells". Journal of Agricultural and Food Chemistry. 55 (23): 9470–8. doi:10.1021/jf071953k. PMID 17939735. ^ Yan X, Qi M, Li P, Zhan Y, Shao H (2017-10-05). "Apigenin in cancer therapy: anti-cancer effects and mechanisms of action". Cell & Bioscience. 7: 50. doi:10.1186/s13578-017-0179-x. PMC 5629766. PMID 29034071. ^ Forkmann, G. (January 1991). "Flavonoids as Flower Pigments: The Formation of the Natural Spectrum and its Extension by Genetic Engineering". Plant Breeding. 106 (1): 1–26. doi:10.1111/j.1439-0523.1991.tb00474.x. ISSN 0179-9541. ^ Herrmann KM (January 1995). "The shikimate pathway as an entry to aromatic secondary metabolism". Plant Physiology. 107 (1): 7–12. doi:10.1104/pp.107.1.7. PMC 161158. PMID 7870841. ^ Lee H, Kim BG, Kim M, Ahn JH (September 2015). "Biosynthesis of Two Flavones, Apigenin and Genkwanin, in Escherichia coli". Journal of Microbiology and Biotechnology. 25 (9): 1442–8. doi:10.4014/jmb.1503.03011. PMID 25975614. ^ Austin MB, Noel JP (February 2003). "The chalcone synthase superfamily of type III polyketide synthases". Natural Product Reports. 20 (1): 79–110. CiteSeerX 10.1.1.131.8158. doi:10.1039/b100917f. PMID 12636085. ^ Martens S, Forkmann G, Matern U, Lukacin R (September 2001). "Cloning of parsley flavone synthase I". Phytochemistry. 58 (1): 43–6. doi:10.1016/S0031-9422(01)00191-1. PMID 11524111. ^ Leonard E, Yan Y, Lim KH, Koffas MA (December 2005). "Investigation of two distinct flavone synthases for plant-specific flavone biosynthesis in Saccharomyces cerevisiae". Applied and Environmental Microbiology. 71 (12): 8241–8. doi:10.1128/AEM.71.12.8241-8248.2005. PMC 1317445. PMID 16332809. ^ Meyer H, Bolarinwa A, Wolfram G, Linseisen J (2006). "Bioavailability of apigenin from apiin-rich parsley in humans". Annals of Nutrition & Metabolism. 50 (3): 167–72. doi:10.1159/000090736. PMID 16407641.